The annual Christmas party our friends always gather for every winter was Saturday night, and it was a wonderful excuse to bake the peppermint and coconut Christmas cake creation I’d been creating in my head for the past month. 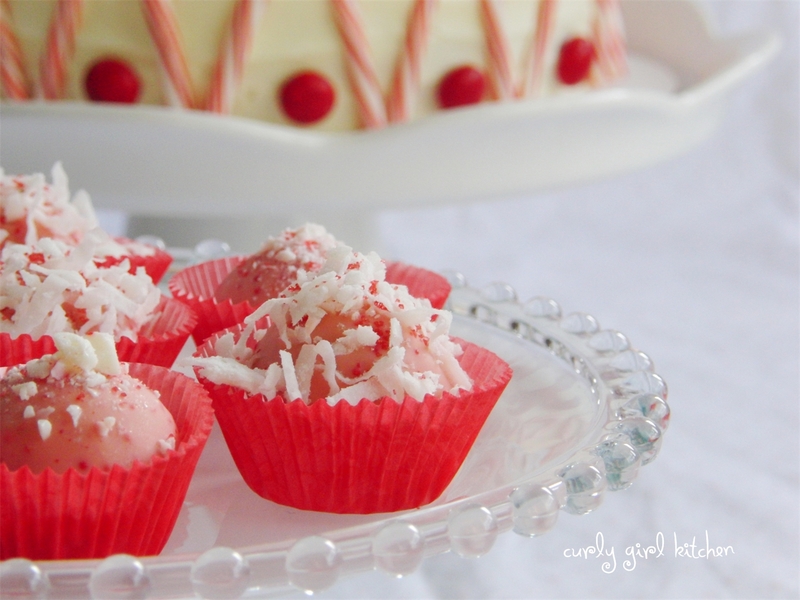 I started with three moist, thick layers of coconut cake (although chocolate would be amazing, too! 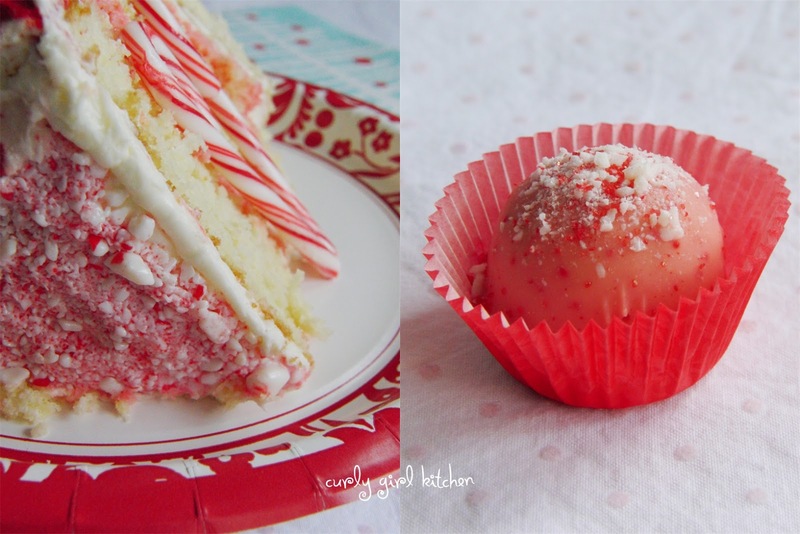 ), filled and frosted with a creamy buttercream with just a hint of peppermint extract, and crushed peppermint candy sprinkled between each of the layers. Peppermint candy gets sticky when exposed to moisture, like the buttercream, and when I crushed it and sprinkled such a thick layer on top, what I didn’t realize is that the stickiness would then cause all those little crushed pieces of peppermint to stick back together, forming a sort of crust on top of the cake, which was impossible to cut through without destroying the cake. So, I ended up cutting big wedges through each section (through one of the 8 divider lines on top where there was no peppermint), and then cutting those wedges into smaller pieces along the cake layers. Because I don’t want you to experience the same problem I did, just remember these tips. 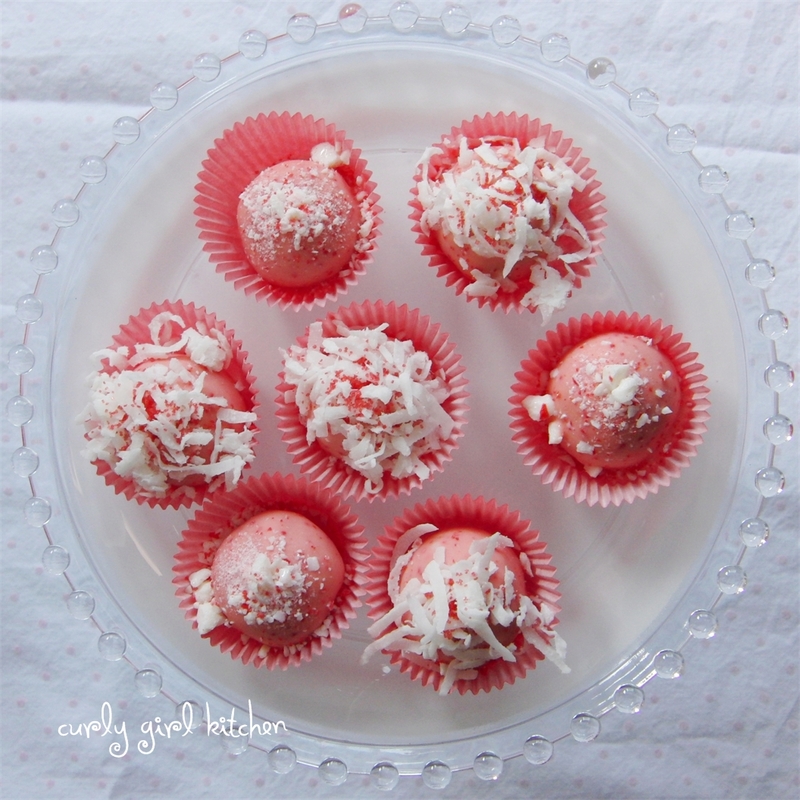 · Don’t crush the peppermint too finely – you want small crunchy pieces, but not powder. 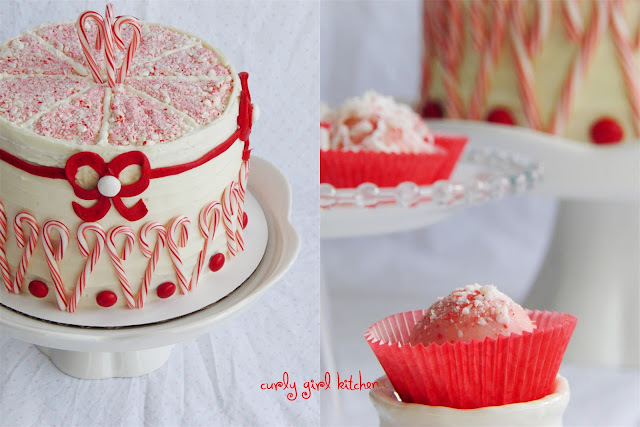 · Use a much lighter hand than I did when sprinkling the peppermint on top, making sure the candy is sparse enough that it’s not going stick together – in other words, you need to be able to see the buttercream. 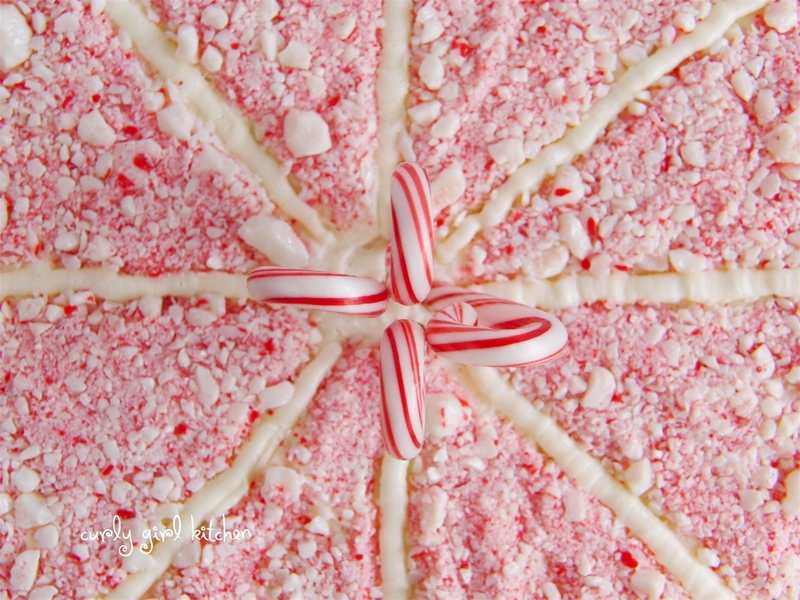 The easiest part, of course, was sticking little mini candy canes and M&Ms all around the bottom edge – I arranged them to look like hearts. A few mini candy canes on top of the cake looked like a pretty little crown. 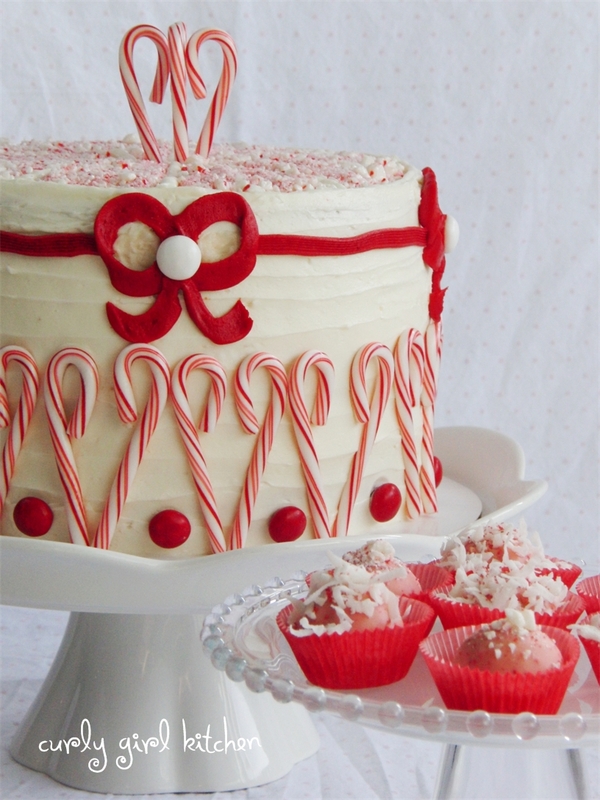 Lastly, I tinted some of the buttercream Christmas red, and used a flat tip to pipe a ribbon around the cake. Then I piped 4 bows for the finishing touch so it looked like a present all wrapped up. 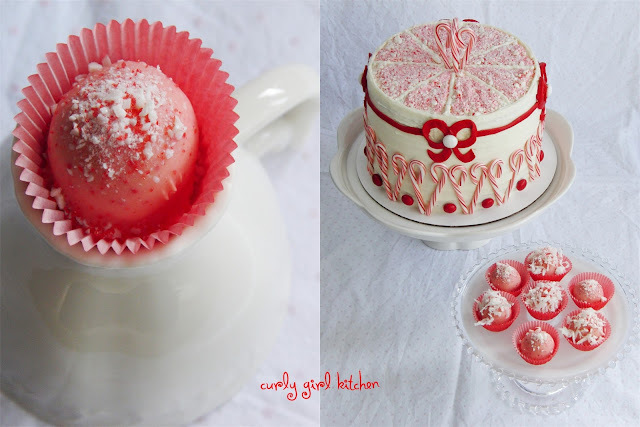 I’d never piped bows before, and if you haven’t either, I would suggest practicing a few on a plate first, until you like how they look, before going “live” on the cake. I had to redo mine a few times until I was happy with them (you may be able to see a few places where I scraped red frosting off and then tried to repair it). 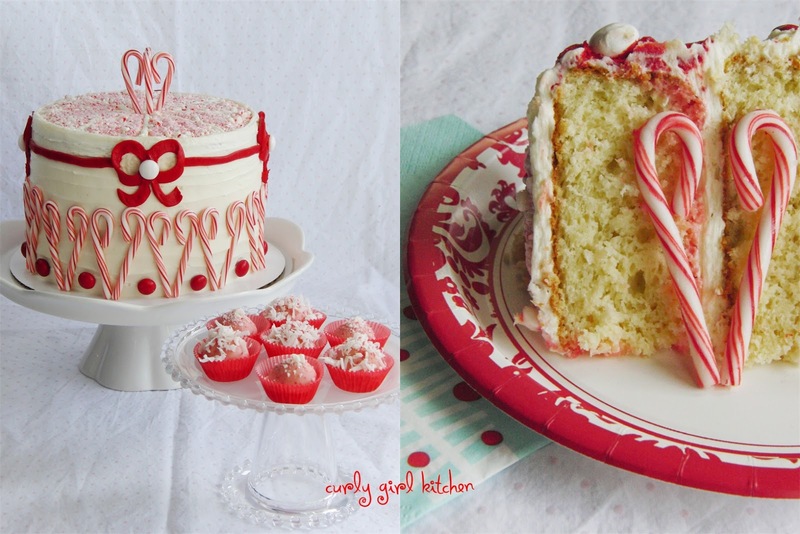 In the end, I wished I’d started the ribbon lower down, so that it was running through the “knot” of the bows, but I think in spite of its imperfections, the cake turned out really pretty and festive. Not to mention, it tasted amazing! 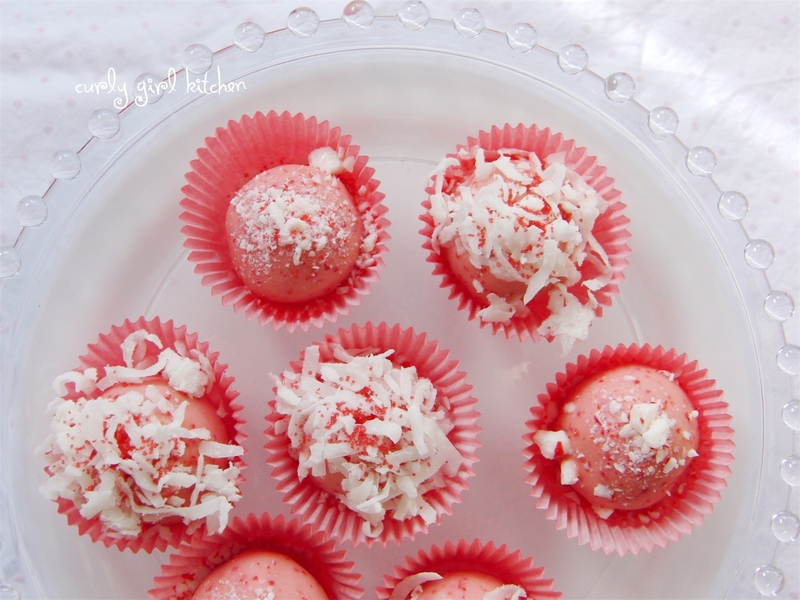 I know that chocolate and peppermint is a classic combination, but the peppermint with coconut was refreshing and wintery. You know I love to use my cake scraps, so of course I saved the scraps after leveling the cakes, tossed them into the food processor with a little leftover buttercream and crushed peppermint, and pureed it into a thick, creamy paste. Shaped into balls, dipped in chocolate, sprinkled with coconut, peppermint, sprinkles or whatever you like, and then chilled, these little cake truffles are a little bite of deliciousness, and always the first thing to disappear at a party. 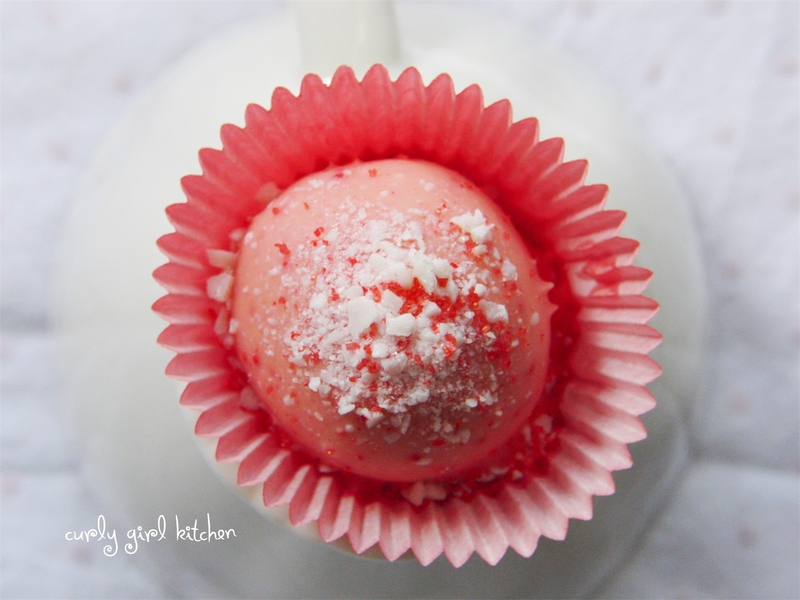 I actually melted some red and white striped peppermint Hershey’s kisses for dipping the truffles into, which is why they have a pretty pink chocolate coating, which I thought looked really beautiful with the red peppermint and snowy white coconut. I doubled the recipe for a large, tall cake to feed a crowd – since my 8-inch pans have high sides, I was able to bake 3 thick cake layers. If you double the recipe but aren’t sure your pans are high enough, bake in 4 pans instead of 3. Doubling the cake doesn't mean you need to double the frosting; 1 1/2 x the amount of frosting should be enough for a taller cake. Preheat the oven to 350. Spray three 8-inch round pans with non-stick spray, line the bottoms with parchment paper and spray the parchment as well. 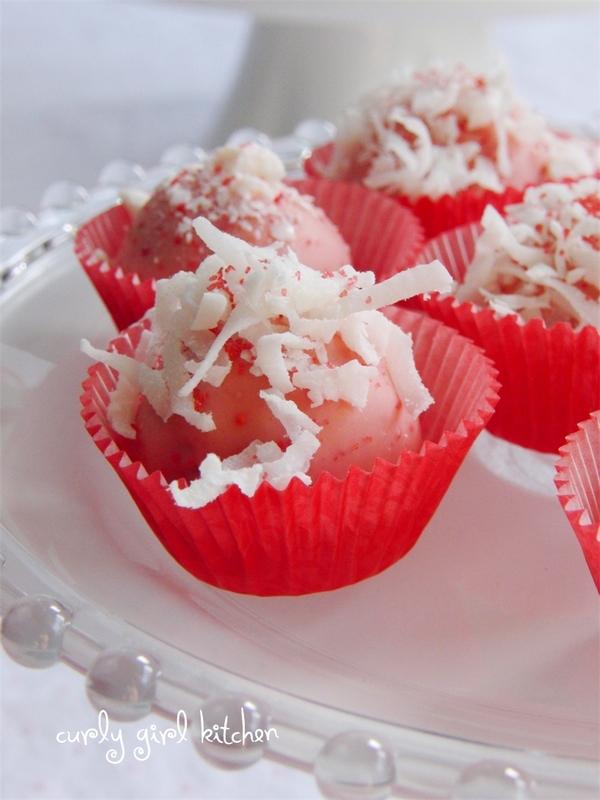 In the bowl of your stand mixer fitted with the paddle attachment, combine the cake mix and coconut. Add the coconut milk, eggs, vanilla and coconut extract, mixing on low speed to combine, then on medium speed for 3 minutes. Divide batter between the pans and bake for 22-25 minutes, until golden and a toothpick comes out clean. 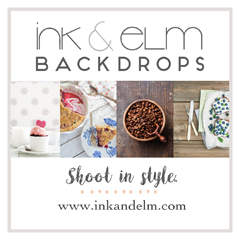 Set pans on wire racks, cover loosely with a clean kitchen towel, and cool completely. In the bowl of your stand mixer fitted with the whisk attachment, mix the butter on low just so it sticks to the sides. In a separate bowl, combine the powered sugar and meringue powder. Gradually add to the mixer, while mixing on low, and mix until moistened. Add the milk and extracts; increase speed to medium high and whip for 4-5 minutes, scraping the bowl once or twice, until very light and fluffy. 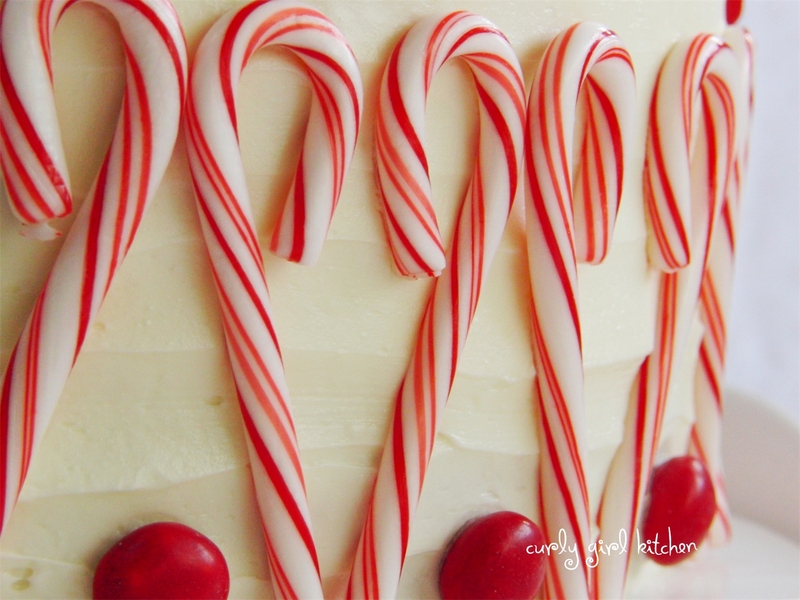 Level all the cakes with a sharp knife or cake leveler; peel off the parchment paper. 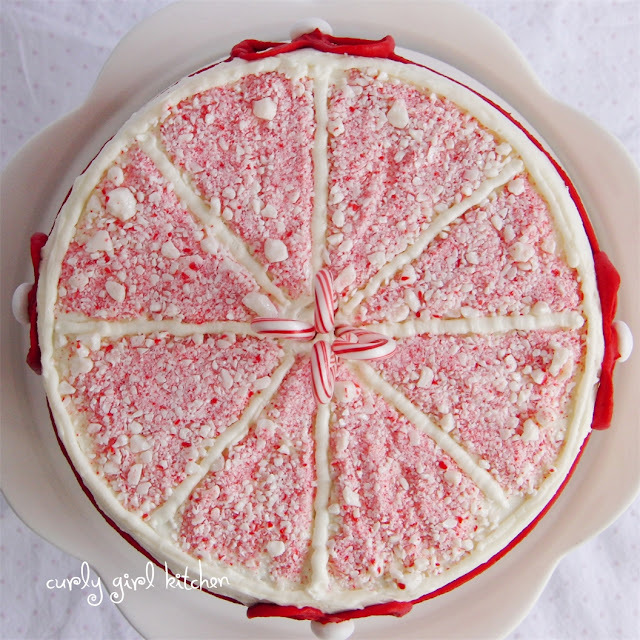 Place one layer of cake bottom side up on a cake board or serving plate. 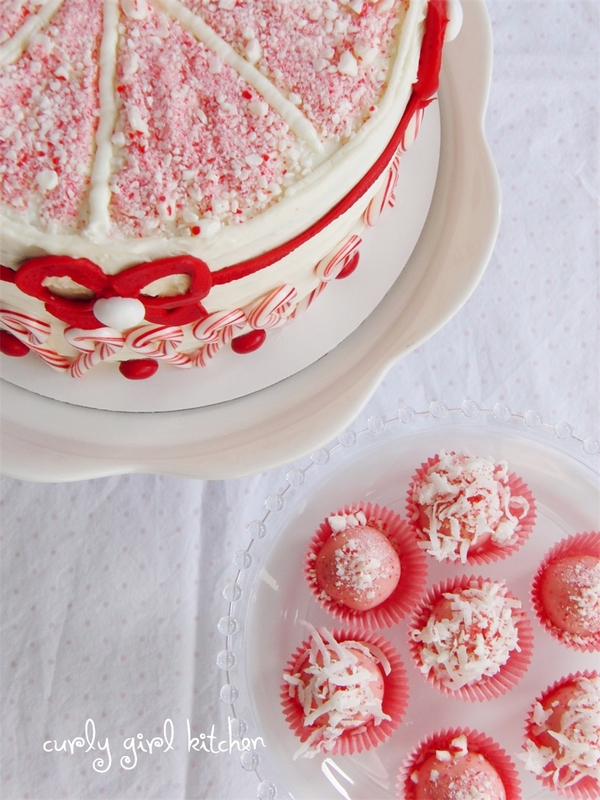 Spread with a ¼ inch layer of buttercream. 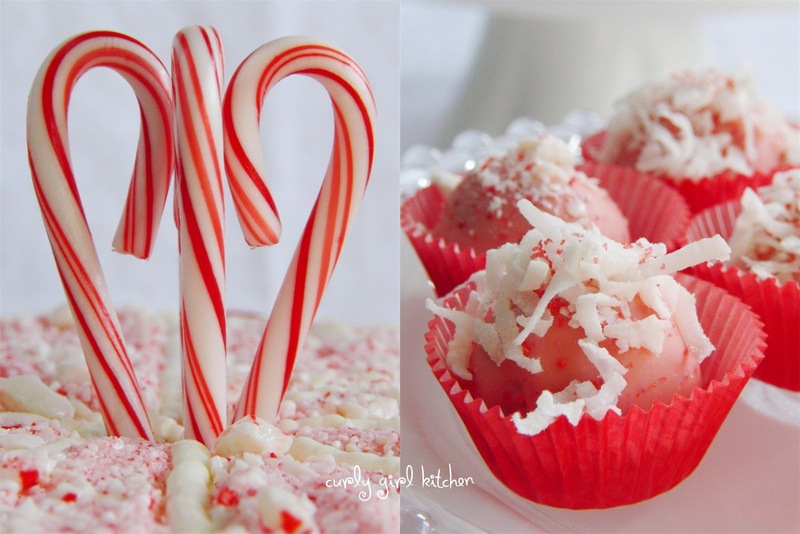 Sprinkle with ¼ cup of the crushed peppermint candy. 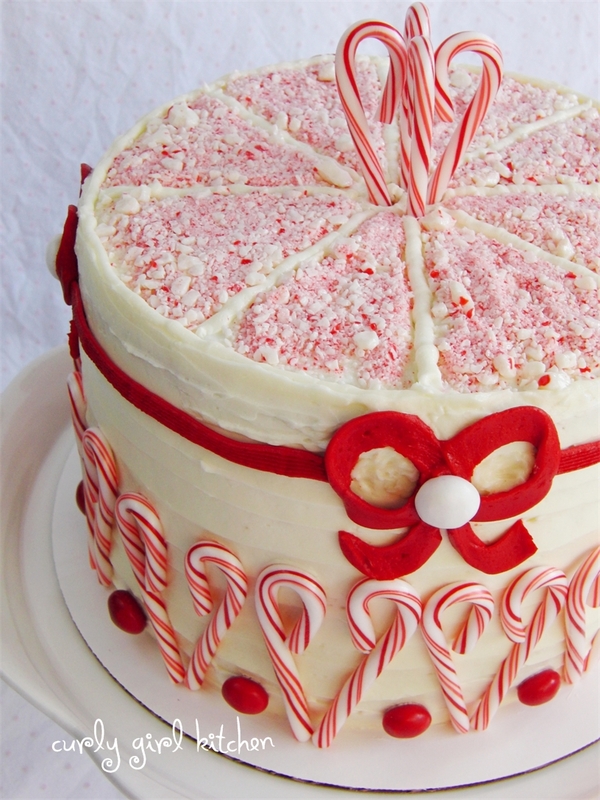 Repeat with the remaining layers of cake. 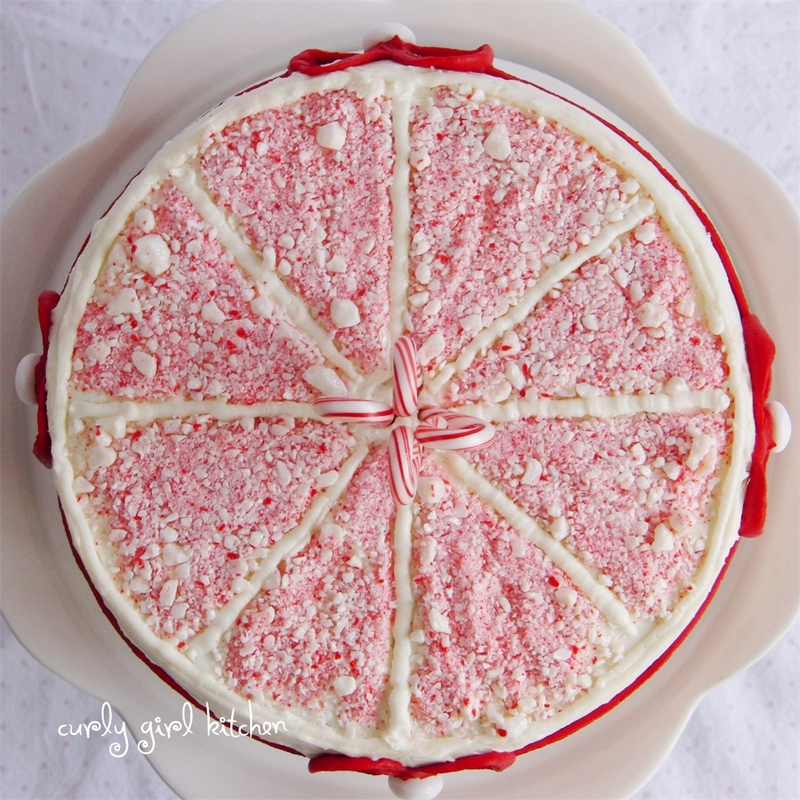 After you’ve placed the last layer of cake on, frost the cake all over with a thin crumb coat of frosting. 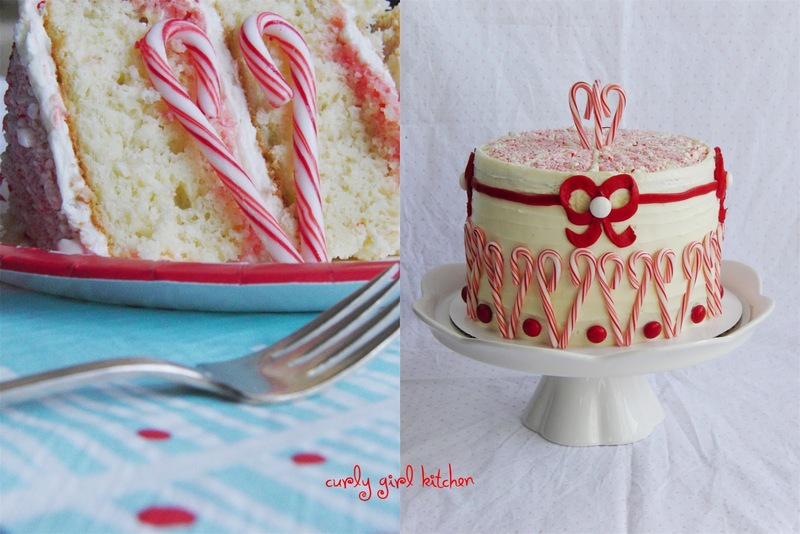 Chill in the refrigerator for 15 minutes, then frost with the final layer of frosting. 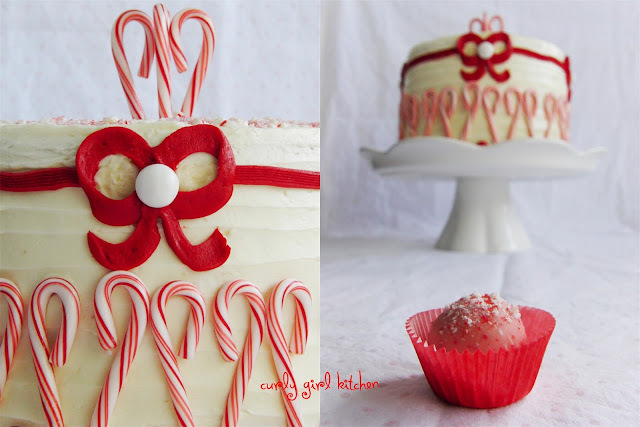 If desired, use any leftover frosting to pipe decorate borders on the cake, or color with red food coloring to pipe the ribbon and bows as shown. Decorate with the candy canes and M&Ms.